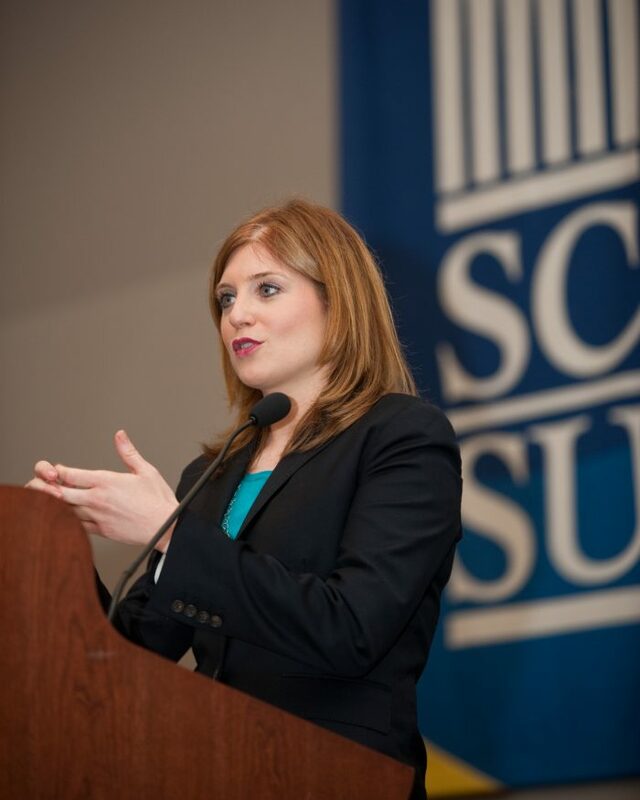 Erin McPike, a reporter covering the presidential race for Real Clear Politics, shared her insight into the 2012 elections during an Oct. 24 forum at Southern. McPike was the keynote speaker for the forum, “Politics and Apple Pie: A Look Into The 2012 Presidential & Congressional Elections.” The event drew about 225 people into the Michael J. Adanti Student Center, Grand Ballroom. She had been a frequent guest on MSNBC and FOX offering analyses of national politics. She also had appeared on CNN, ABC, CBS, C-Span and BBC, as well as NPR radio. Since the forum, McPike has landed a job as a general assignment correspondent with CNN. Before working for Real Clear Politics, an online political news and polling publication, McPike was a reporter with National Journal, a weekly political magazine. She also had written articles for Campaigns and Elections, a political insiders’ magazine. She covered former Gov. Mitt Romney’s (R-Mass.) first presidential bid in 2008 as an embedded reporter with NBC News. She holds bachelor’s degrees in journalism and in political science from the honors program at American University. She encouraged students to make their voices and opinions about local, state and national politics heard. She also discussed how Ohio was a key state to watch on Election Day. A panel discussion – moderated by Diane Alverio, publisher of CT Latino News and a former TV journalist — followed McPike’s keynote speech. The panelists included: Neil Levesque, executive director of the New Hampshire Institute of Politics and Political Library at Saint Anselm College in Manchester, N.H.; Art Paulson, chairman of the SCSU Political Science Department; Theresa Marchant-Shapiro, SCSU assistant professor of political science; Julian Madison, SCSU associate professor of history, and Lesley DeNardis, associate professor of political science at Sacred Heart University. Levesque was frequently tapped by national media during the months leading to this year’s New Hampshire primary. The New Hampshire Institute of Politics hosted presidential debates run by ABC, FOX and CNN. But here are a few things they probably didn’t do: They probably didn’t write a chapter in a book called “The Red Sox and Philosophy: Green Monster Meditations.” They probably did not link “Red Sox Nation” with an Eastern philosophical approach that values “we” more than “I” and attributes the opposite philosophical outlook to the New York Yankees. And they almost certainly didn’t share those views as part of a talk in a bar located in New York. Nevertheless, Chelsea Harry, 31, a newly hired assistant professor of philosophy at Southern Connecticut State University, has combined the academic philosophical studies of Descartes and Confucius with real world subjects, such as baseball. Her book chapter, “We Are Family: The Self and Red Sox Nation,” published two years ago by Open Court, weaves in the differences between Eastern and Western culture and how they apply to the Red Sox and Yankees. In her teaching, she hopes to weave the traditional deep, philosophical subjects with some of today’s popular culture as a way to show students how philosophy is relevant to their lives. “I had written the Red Sox piece as a way to teach an important difference between eastern and western concepts of self using a popular model of rivalry,” she says. What she found – with a mixture of factual information and an admitted biased perspective – was that while both teams and their fans enjoyed much success, there are significant differences that are rooted unconsciously in Eastern and Western philosophical approaches to life. She notes that this sort of “oneness” with the team may be attributable, at least in part, to the decades and decades of shared disappointment. The Red Sox had gone 86 years without a World Series championship until their victory in 2004. To make it even more painful, several times they had risen to the brink of baseball nirvana during their drought, only to fall short in post-season play. By contrast, she said the Yankees have embodied more of a philosophy that has been historically pervasive in the West. It’s more oriented to the individual – hiring many all-star players and hoping that the whole will equal the sum of all the individual talent. She said they seem to have a sense of entitlement – a belief that they should and must win the World Series each year. Anything less than winning the World Series is viewed as a failure in their eyes. “Yes, the Red Sox sought to hire some all-star players, as well, but not to the same degree,” she says. “And they have relied more on the intangibles and a sense of community.” The ultimate success of the “Idiots,” the nickname of the Red Sox team in 2004, is an example. “I suppose we should leave open the possibility that the Yankee fans might be more of a community if they were to suffer for a long period of time with losing teams,” she says. “In fact, I would like to be able to test that theory,” she jokes, admitting that she is a lifelong Red Sox fan and grew up in Massachusetts. When a Red Sox player puts himself ahead of the team, the fans will turn on him, she says. She noted the departure of Manny Ramirez, who after months of reported temper tantrums and egoism, was traded to the Los Angeles Dodgers in 2008. But the fans grew tired of him well before the trade, despite being among the best hitters in the American League. She points to the constant ego battles on the Yankees during the late 1970s and early 80s, such as between Reggie Jackson and manager Billy Martin, and between Martin and Steinbrenner, as typifying how they put “me” ahead of “we.” And while those dramas have subsided on the Yankees of today, she said you still see A-Rod’s celebrity status in social circles, and Derek Jeter appearing in TV commercials. *A Nov. 18 column in the New Haven Register by Randy Beach focused on Lisa Siedlarz, who has written a book of poetry about her brother’s (Kevin) deployment in Afghanistan. Lisa is a loan administrator in the Office of Financial Aid and Scholarships. *Deborah Carroll, professor of psychology, was interviewed Nov. 18 on Channel 61’s morning news show for her recent selection as Connecticut Professor of the Year by the Carnegie Foundation for the Advancement of Teaching and the Council for Advancement and Support of Education. The interview ran for about 4 1/2 minutes. Deborah was also featured in the Nov. 15 edition of the New Haven Register for the same award. And Channel 8 posted an article on its website about her award on Nov. 14. *Wes O’Brien, chairman of the Media Studies Department, was the focus of a Page 1 story in the Nov. 11 (Sunday) edition of the New Haven Register pertaining to his research on music that is played in war movies. He found that the music is often indicative of society’s changing attitudes toward a particular war. *The SCSU Veterans Association was highlighted in an article that appeared in the Nov. 8 edition of the New Haven Register. The organization had participated in a charity event for a Connecticut veteran who killed during the Iraq War. About 125 seventh graders from New Haven’s schools will take classes at Southern starting next summer as part of a federally-funded program designed to improve college access and readiness. Southern is one of three higher education institutions in Connecticut participating in the Gaining Early Awareness and Readiness for Undergraduate Program (GEAR UP), a seven-year, $31.5 million project that is designed to serve 3,000 middle school students in New Haven, Waterbury and East Hartford. Southern has been awarded $2 million from the grant, which is funded by the U.S. Department of Education, according to Patricia Zibluk, director of Southern’s Sponsored Programs and Research (SPAR). The 125 students will be selected from about 340 incoming seventh graders next summer from eight schools in New Haven. They will participate in classes and programs in math, science, literacy, and arts and culture for a five-week period during the summer of 2013. A group of 125 students from the same class will do the same in the summer of 2014 – some of whom will be the same students who came to Southern the summer earlier. The summer sessions will continue through 2018. The 320 incoming seventh graders from New Haven – as well as about 2,700 other incoming seventh graders statewide — will be eligible for college scholarships after high school graduation. About half of the $31.5 million grant is being set aside for college scholarships. In addition, Southern will allocate $1.2 million specifically for those students who participate in the summer program at Southern. They also will be allowed to take 6 credits of classes at Southern tuition free. Students will be given graphing calculators, which will be required to participate in the summer program. Southern also will be playing a key role with the students during the regular school year – such as providing students mentors and tutors, who will be Southern students participating in a teaching program. In addition, both students and their parents will be eligible to participate in financial literacy programs, as well as information sessions about financial aid.